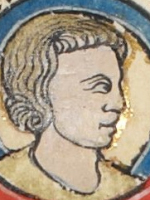 William was born 17th August 1153 and died in April 1156. He was the eldest son of King Henry II of England and Eleanor of Aquitaine. He was made ruler of Poitiers by his mother.